Ramanathaswamy Temple in Rameshwaram in the state of Tamil Nadu is one such beautiful ancient temple. Apart from being a gorgeously colorful temple, it is one of the most sacred temples for Hindus and among one of the twelve jyothirlinga temples of Lord Shiva. According to Ramayana, the holy scripture of Hindus, Lord Rama is believed to have prayed Lord Shiva here to absolve himself of the sin of killing a brahmana – Ravana – in the fight between good and evil. Lakhs of people from all across India visit this temple, located at the confluence of Indian Ocean and Bay of Bengal, just few miles away from Sri Lanka. I shot this photo when i visited this temple in the summer of 2013. It was really a hot day with scorching heat outside. But once inside the temple, i was soon forgotten about it seeing the vivid colors in the world-famous corridors of this temple. This temple has the distinction of having the longest corridor for any Hindu temple in the world. My shot captures a different perspective of this corridor where three Rathas are kept, which are used on auspicious festive occasions. More photos of Weekly Photo Challenge Vivid Weekly Photo Challenge: Vivid. This entry was posted in Art & Culture, India, Indian Temples, Photography, Travel and tagged Architecture, Holy Scripture of Hindu, Longest Corridor in the World, Lord Shiva, Ramanathaswamy Temple in Rameshwaram, Ramayana, Rameshwaram Temple, Temples of South India, Temples of Tamil Nadu, Tradition and Culture, Travel, Twelve jyothirlinga Temples of Lord Shiva, War between Good and Evil. Bookmark the permalink. This is a wonderful picture Suyash! The art and the colors look unbelievable. I had heard about the temple but never visited it. Try and post more pictures of the place as it looks captivating. Kudos to the artists who decorated it so well. I didn’t mention I wandered the corridors of this temple for over a month – my absolute favourite Indian location. There was no bridge back then so no cars on the island. It was quiet and peaceful. Please post more on this location. Wow, that’s interesting. You are such a traveled person. I mean, you traveled when there was no bridge. That must have been quite few decades earlier then. Which year was it – any faint remembrance? Did you take train because i know Pamban train bridge existed long back and trains used to reach this place since few decades? I am curious to know now more about the past. Even now I found this island to be very peaceful. So less people. Did you visit Dhanushkodi, the tip of the island where Bay of Bengal sea and Indian Ocean meets? I regret I didn’t get to Dhanushkodi. I would have had to walk and it was very hot when I was there. There were no surfaced roads back then and yes I did arrive by train as that was the only way to get to the island as I was intending to go by ferry to Sri Lanka. Hmmm….yes, Dhanushkodi is quite some miles off on the island and back then, I am sure there would be no source of transport, unlike now. Sometimes I really wonder how people used to travel countries 30-40 years back. Now with the help of technology, its such a simpler affair with tons of information available. Must have been a completely different experience for you then. Plan it then. You will find lot of changes in the place. I am sure you will enjoy it and have a different kind of experience this time. I agree with you Mallee. In order to promote tourism and habitation along with mindless planning, most of the times, pristine beauty of nature gets lost. That’s a sad reality of today’s times. Please visit https://thehutownerblog.wordpress.com ….for a challenge to do ! Aha…this looks pretty interesting and challenging. Very different from other challenges. Thanks for nominating me for this. I would love to do it and would attempt it this weekend. Really sorry that I cannot do it immediately due to constraints. O yes, its been maintained very well and some kind of renovation and patch up work keeps happening to maintain the temple. Authorities have done real good job. Thank you. Got the flash back of my trip to Rameshwaram, still feel blessed to visit it. The picture is beautifully taken. Thats great to know Babita. Rameshwaram is a beautiful place, and I am sure you must have had fun there. Thanks for visiting my blog and for your appreciation. You are out of the blogging scene these days. When do we get to read your next blog? i m working on it…hope i get something good to work on. It is indeed a very beautiful and colorful temple, Aqui. I will share more photos of its splendor in some other posts later. O yes, the temple has got really long corridors but you are not tired walking those distances because you witness plenty of colors, architecture and interesting statues all along with way. You will find people from over India inside the temple. I would definitely say so. Very spiritual experience as well. Moreover, its so close to the confluence of two big seas – Indian Ocean and Bay of Bengal – which makes the experience so unique. If you have ever been to a temple in India or elsewhere, you would experience for yourself the richness of these temples, not only from a religious perspective but also from an art and architecture perspectives. Wonderful. So now your appetite for Indian spicy dishes could be satiated fabulously. Great to know that there is this Indian store. but just for the record – my husband officially said I am not a foodie. I agree as well – I mean – I like to try stuff and appreciate quality and of course cultures – or as you note -t he cuisine across cultures – but at the end of the day – food is often on the B list for me – making me less of a foodie than some – but I guess it depends on how you define foodie – are you one? suyash! 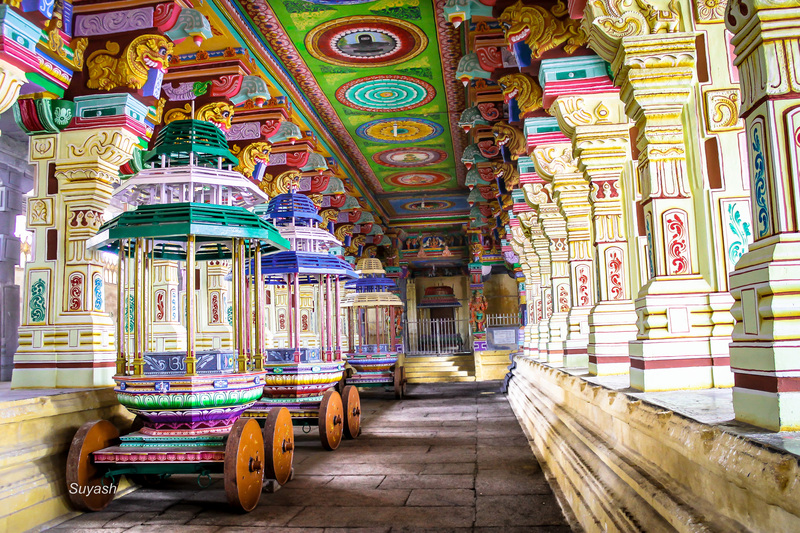 Generally the variety of colors used in the temples of South India exceeds the one in North India! This is especially true in shikhara. I cannot say this is always true but yes, this is a general observation. I guess each temple style of architecture has its own unique thing. Anyways! its a nice picture for the challenge! Thats a very nice observation and it is true as well, in whatever temples I have seen in South India. Architecture is truly so exquisite with images from ancient scriptures and legends. Suyash is such a great entry to the challenge…This temple corridor is actually so vivid and colorful. I love the gorgeous colors on the ceilings and the Rathas lined up to one side. I have alway wanted to visit this temple and now that my hubby is getting posted close by (wellington, coonoor) I plan to go there sometime. Thanks for sharing this image and all the details ! Great news. From Coonoor, I dont think it will be far. So on any weekend, you can plan it. And when you are in Rameshwaram, do visit Dhanushkodi. Its a magical place where you walk on a small stretch of land, surrounded by Indian Ocean and Bay of Bengal on either sides. BTW, is your husband in defence? Coz I guess Wellington is a famous defence center. If I am not wrong, OTA is also present there. I just adore these Indian temples. Fabulous! These temples are truly hallmark of wonderful architecture and artwork. Cambodia too has got one such temple – the biggest in the world. I am sure you must have visited Angkor Vat, which I wish to visit some day. Not only great color, but wonderful perspective.